The UK auction of 2.3 GHz and 3.4 GHz spectrum has concluded at a higher cost than expected, with O2 winning the most and Three the least. On offer was 40 MHz of 2.3 GHz band, to be used for 4G, and 150 MHz of 3.4 GHz band, to be used for 5G. The bidders were the four UK MNOs plus small-cell specialist Airspan. The total spent was £1.356 billion, well above previous estimates of £630 million to a billion, which might explain why Airspan didn’t end up winning anything. The big winner was O2, which got all the 2.3 and 40 MHz of 3.4 too. EE also got 40 MHz of 3.4 and Vodafone got 50 MHz, but Three only got 20 MHz of it. O2 paid £5.147 million per MHz for the 2.3 and £7.943 million per MHz for its 3.4. Everyone else paid £7.565 per MHz for their 3.4 so maybe there was some kind of premium attached to the winner of the 2.3. Vodafone and Three didn’t issue canned comments, which given the generic and self-serving nature of those above is probably a good thing. Vodafone did offer the following table summarising its licensed spectrum holdings, which runs contrary to everyone else’s assessment of the situation, including Ofcom, so we’re not sure what all that is about. Three also provided the following table, which takes into account the 40 MHz of 3.4 and 84 MHz of 3.6-3.8 it got from the acquisition of UK Broadband. That’s all well and good but if 5G is the only thing that matters, why the years of moaning about 4G that preceded this auction? This was an opportunity for Three to put its money where its mouth is and it declined to do so. “That operators paid higher than expected prices is good for HM Treasury but not so good for consumers, as it leaves the operators with less money to invest in their 5G networks and services. In today’s market, operators are capex constrained,” said Bengt Nordstom of telecoms consultancy Northstream. “It would have made more sense for Ofcom to agree a set 5G licence fee with each operator, which would then leave them with more money to invest in their networks. 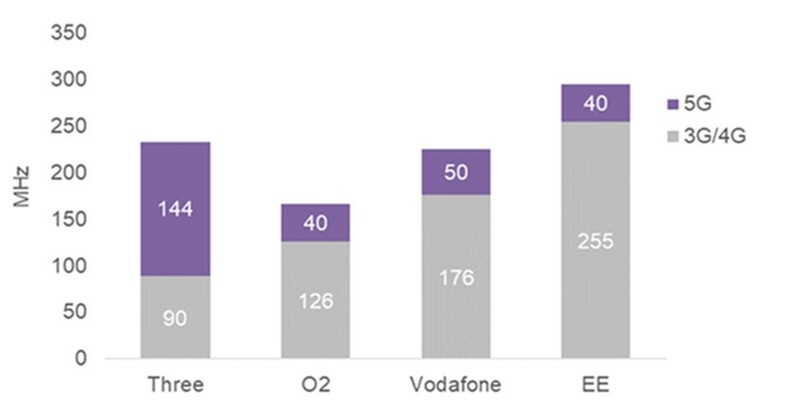 Here is our table summarising the new licensed spectrum holdings for each UK MNO. We’ve also added a second one that includes all the UK Broadband 5G spectrum owned by Three in the 3.4 row, to show how that affects the proportion of total spectrum owned by each of them. Kindly explain how adding 84 and 40 gives you 144? Is it not possible that Vodafone published their ‘paired’ spectrum in units of 2xMHz? Maybe the writer should learn a bit more about the basics of spectrum before posting such drivel. Yes it is. Calm down. Shouldn’t Vodafone’s 2600T holdings be 25 rather than 20 in your table (2570-2595Mhz)? This article is full of mistakes. Not sure where to start correcting them. Clearly the author has no clue what he is talking about. LOL who knew people could get so moody about spectrum auctions? Thank you for your feedback Adam, I really value it, and maybe with your selfless tuition I can one day begin to have a clue what I’m talking about. There was no such premium – which would have been nonsensical. The reason is that round prices increase throughout the auction and O2 was the only bidder to make a bid at the final 3.4 price level, whereas the other operators stopped bidding at the penultimate price level. This can be seen in the bid data released by Ofcom. I was wondering what the 1400 MHz spectrum (owned by Vodafone and Three) might be used for? It was a bad decision to give one operator sole use of the 2300 MHz band. It was also a bad decision to allow the BT-EE merger while forbidding the one proposed by 3 and O2.